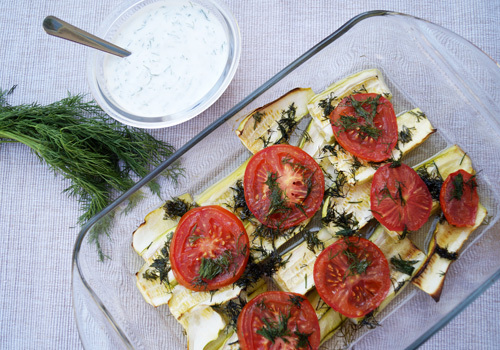 Zucchini with yogurt-dill sauce is a delicious, quick meal for brunch or light dinner. It is just perfect if you are on a diet and combines healthy protein with vegetables for a mix of rich flavors. You can also use any toppings you like. Zucchini is marvelous whether served warm or chilled and lends itself to variety. This recipe is loaded with tastes and nutrients and will simply make a busy day extraordinary. You can also serve zucchini as a festive side dish on any occasion, and your guests will be delighted. Whisk yogurt, add garlic and fresh dill, and combine well. Season with fresh ground pepper and salt if desired and leave aside. Thin with water if too thick to reach the desired consistency. You may also add 1/2 spoon of lemon juice for more flavor. Preheat the oven to 350 F. Then rinse and dry zucchini and cut in halves. Cut halves into thick slices and sprinkle with olive oil. Cut tomato into slices and leave aside. Put zucchini in a pan and pour water on top. Bake until cooked and tender, about 20-30 minutes, then add tomato slices, and cook for 3 - 4 more minutes. Set aside. Put in the fridge for 2 - 3 hours to serve chilled or serve warm with the yogurt dip.